Today, I will introduce a new brand Los Angeles Apparel to you. First of all, zip up a cool look in this classic hoodie! Los Angeles Apparel Flex Fleece Zip Hoodie is made of 50% polyester/50% combed ring-spun cotton fleece. It weighs 8.2 oz. It features matching rib waistband and cuff. Unlined hood, white contrast drawcord and white metal zipper are so charming elements. Kangaroo pockets give you room for your essentials. It is made in USA. The size is XXS-2XL. 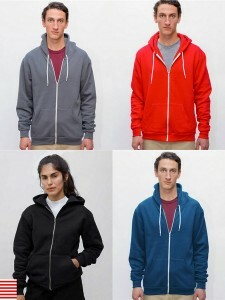 You can also choose a Los Angeles Apparel Heavy weight Fleece Zip up Hood. It is made of 100% cotton (Note: 98% cotton/2% polyester). Shrink-free from a wash process to eliminate shrinking. It also features double lined hood, YKK zipper, ribbed cuffs and waistband. There are two classic colors in total. Go and be the focus on the street immediately with this one! Hit the street when summer comes for it’s hightime show yourself up in a nice tee. Los Angeles Apparel Tri-blend Tee is made of 50% polyester/25% cotton/25% rayon. Reinforced shoulder construction is the feature. It retains shape and elasticity. It weighs 3.7 oz. You can choose among the five colors. Now, what will perfectly protecting you under the burning sun? 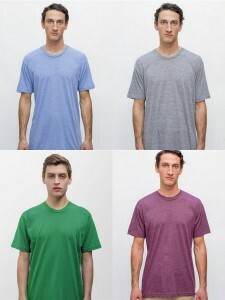 Los Angeles Apparel 50/50 Poly Cotton Tee is a wonderful choice. It is made of 50% polyester/ 50% combed ring-spun cotton. So it is durable and comfortable. Baby rib cotton stretchable collar, reinforced shoulder construction and double-needle bottom hem. It is also made to satisfy you in summer. A cool guy is about to come as long as you put it on. Pull yourself out of boredom with a tee! Los Angeles Apparel Ladies Fine Jersey Tee is a nice example. Its material is 100% combed ring-spun cotton. The features of taped shoulder-to-shoulder is so durable. It features durable rib neckband, double-needle sleeves and bottom hem. There are more than ten colors. Los Angeles Apparel 100% Cotton Tee is another option. 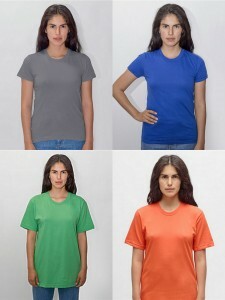 It is made of 100% combed ring-spun cotton, both are strong guarantee of durability and comfortness. Double-needle sleeves and bottom hem are durable. It also features taped shoulder-to-shoulder and durable rib neckband. It is 30 singles Fine jersey. Now, tell me what do you like in the comments.